As I wrote in an article over at Lifehack.org, there’s a game we’re all playing, like it or not. It’s called 100 Marbles, and you win by allocating your “marbles” (units of time, attention, effort, and energy) in new ways to achieve more out of life than if you were to maintain your current marble allocation. 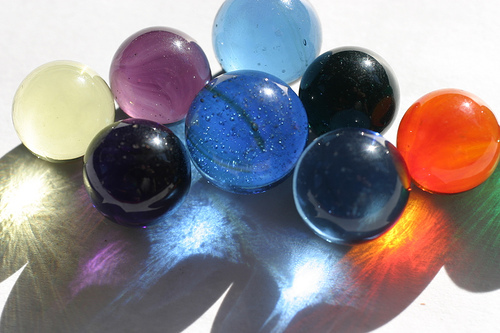 It sounds simple: invest your marbles thoughtfully, improve your results. But before you can even try to win this game, you need to know how you’re investing your marbles now. Ironically, most of us have no idea how we allocated our time, attention, effort, and energy over the last month. Even though you were there for every minute of it, you would probably be amazed to learn the actual, exact allocation of your 100 marbles during this time. The only way to truly know how you’re investing your marbles is to keep a time log. I was persuaded to try a time log by three superb books that make strong cases for it: 1) The Effective Executive, by Peter Drucker (1966); 2) How I Raised Myself From Failure To Success In Selling, by Frank Bettger (1947); and 3) The Critical Path To Sales Success, by Frank Sullivan (1970). I have kept a time log for 1-2 week periods about six times over the last few years, and each time, the results have been eye-opening and enlightening. Just the act of keeping a time log radically increases my awareness, from moment to moment, of what I’m focusing on – and what I’m not focusing on. It’s like having a mini coach sitting on my shoulder, with a stopwatch in one hand and a clipboard in the other, watching everything I do. Wasted time becomes more intolerable and painful, and long stretches of uninterrupted time on important projects and pursuits become the Holy Grail of productivity. This entry was posted in Books, Creativity, Effectiveness, Leadership, Life, Productivity, Success, Work. Bookmark the permalink.